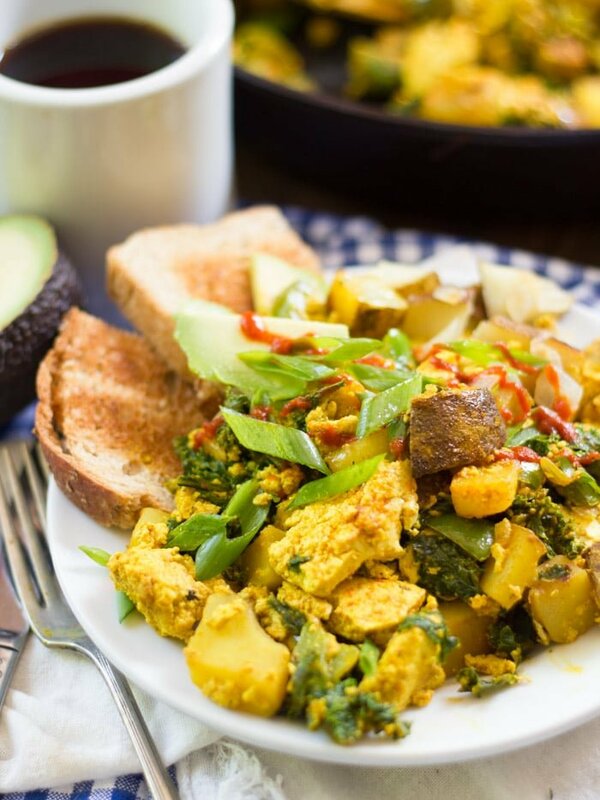 This tofu scramble is a delicious savory vegan breakfast, made with spiced tofu, kale and crispy potatoes. Delicious on it’s own or stuffed in a tortilla! As I’m sure I’ve mentioned before, I was never into eggs. A lot of people think that this means I’m also not a “breakfast person.” So not true! Breakfast is my favorite! Of course, once you eliminate eggs from a vegetarian breakfast, it may appear that your only remaining options are of the sweet, batter originating variety. Also not true. 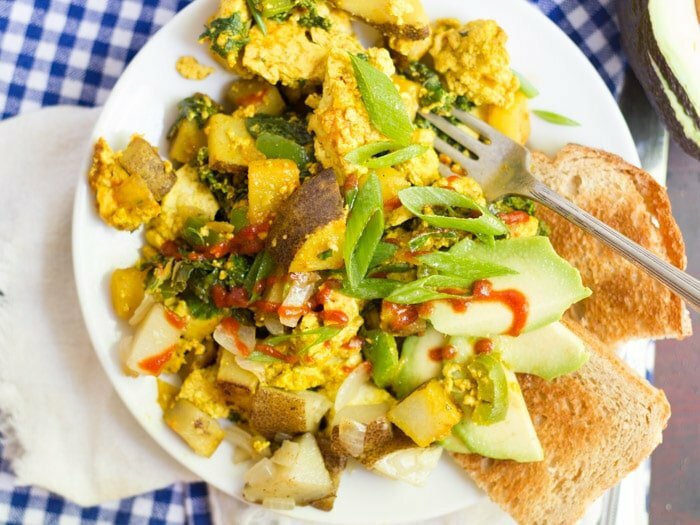 Tofu scramble is my absolute favorite savory, protein rich, vegetarian breakfast. It’s so good that you will want to eat it for lunch and dinner too. In this recipe, the light crumbly texture of the tofu mimics that of scrambled eggs and the turmeric mimics the yellow eggy color. As I write this, I recognize that what I’m saying may seem nonsensical, given that I just told you how I do not like eggs. It doesn’t make sense to me either. I like this. Don’t like eggs. People who eat this tell me it tastes like eggs, but whatever it is about eggs that turns me off (the smell, something subtle about the texture maybe? ), it is not to be found in this dish. Bottom line: if you like eggs, eat this – it tastes like them. If you don’t like eggs, eat this – it doesn’t taste like them. This recipe includes nutritional yeast. You may have seen this ingredient casually thrown into some of my other recipes as an option. In this recipe I strongly suggest you include it. Nutritional yeast is actually deactivated yeast. While this may not sound too appetizing, it actually packs a lot of savory flavor, and is fantastic for adding a cheesy, nutty flavor to recipes, while at the same time upping protein content. A must have for vegans, and particularly useful in making vegan cheeses or cheese based dishes, you can purchase this stuff in most health food stores or online. I enjoy this scramble most when wrapped up in tortilla to create a breakfast burrito. You could also pile it up on some toast or an English muffin, or just heap it up right on the plate. An excellent condiment for this dish is a mixture of about 50% ketchup and 50% sriracha. 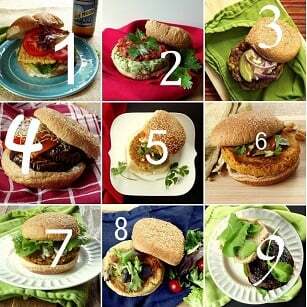 This post originally published on Connoisseurus Veg on March 28, 2013. 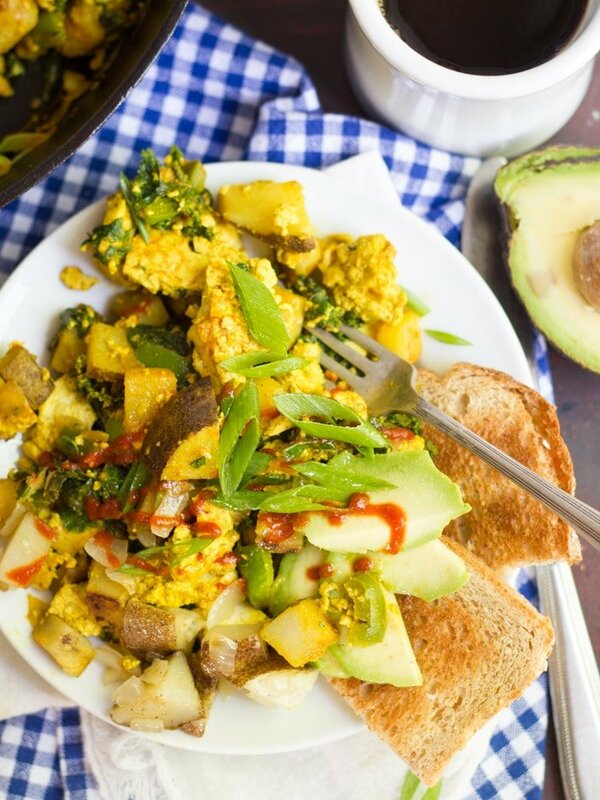 This tofu scramble is a delicious savory vegan breakfast, made with spiced tofu, kale and crispy potatoes. Delicious on it's own or stuffed in a tortilla! Coat the bottom of a large skillet with oil and place over medium heat. Add potatoes and cook until they begin to brown, about ten minutes, flipping occasionally frequently. Add onion and continue to sauté for about another two minutes, until onion begins to soften, then add garlic and cook until fragrant, about another thirty seconds. 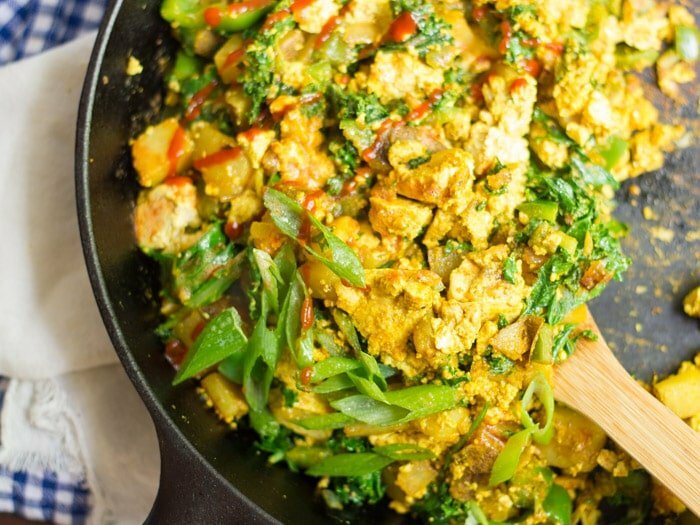 Break tofu into bite-sized chunks and add to skillet, followed by kale, veggie sausage if using, nutritional yeast, spices, soy sauce and hot sauce. Continue cooking and flipping about another five minutes. Finally, add bell pepper, cook about another two minutes, so pepper is hot but still crispy. Remove from heat and season with black pepper and optionally spinkle with some kala namak. Scoop onto plate, toast or a warm tortilla for a breakfast burrito. Top with scallions, shredded cheese, ketchup, hot sauce, ketchup mixed with hot sauce, avocado, or whatever else you think might be delish. Nutrition information does not include vegan sausage. Hi! Thanks for posting this recipe. It was awesome. You’re welcome! This is one of my favorites – so glad you enjoyed it too!! Made this tonight for dinner and it was a hit with my hubby and 2-year old. Thanks for a quick and easy weeknight dinner recipe. I love how the turmeric makes it look so much like eggs! Glad you enjoyed it! I just made a batch over the weekend myself and it’s still a favorite. Thank you so much for sharing your results!! I totally agree! I eat tofu scrambles, but I never loved eggs as an omni unless they had lots of veggies and cheese to cover up the after taste. I think it’s the sulfury taste. My husband, who loves eggs, puts kala namak all over his scrambles for that flavor, but I’m not into it at all. Tasty recipe Alissa! I added some lime juice. Would use Field Roast Apple Sage Sausages. And would crisp potatoes and put them aside until very end. Sautée onions, garlic, tofu, spices, pepper. Stir in kale and crisp potatoes at the very end otherwise potatoes are soggy and kale overcooked. BBQ sauce, chili garlic sauce, ketchup and other condiments on the side.